Born to Go's Carl Howard has been an active cassette networker since the 1980's (having moved into CD's as well) and a busy musician to boot. As the following three reviews illustrate, his interests are as wide as the varied music he promotes through his Audiofile Tapes label. 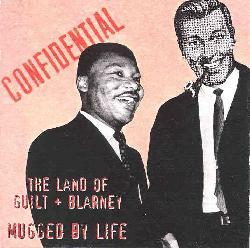 The Land Of Guilt + Blarney is Born to Go's Louis Boone and Carl Howard on keyboards and effects, plus Reginald Taylor contributing some guitar. These are mostly longish exploratory instrumentals but covering very different styles. "Club Deefo", "Rhythm 'N' Bones", and "Celibate Rock" are primarily electronica tunes. "Club Deefo" is often on the spacey side, has a good sense of theme and development, and would be a great soundtrack to a sci fi B-flick. "Rhythm 'N' Bones" has some eerie synth work and includes an odd sounding, slightly psychedelic Middle Eastern guitar (I think it's the guitar). A little like an old Snakefinger/Residents tune. "Celibate Rock" is similar to "Club Deefo" but more on the orchestral prog rock side. Taking a completely different turn toward avant garde chamber music is "This Mold House" and "Percusstipation". "This Mold House" features atmospheric strings, percussion, piano, and all manner of attacking them. I had to put on the headphones to catch all the quiet, subtle things happening here... not to mention that it just sounds better pumping it directly into the brain. "Percusstipation" is similar to "This Mold House" but far more intense. Always dark, the mood and atmosphere changes continually. And as the title suggests, this is a percussion heavy piece. I really found these to be the more interesting tracks, possibly because it introduced yet another side to these musicians whose work I'd previously known from Born to Go and early electronic Alien Planetscapes. 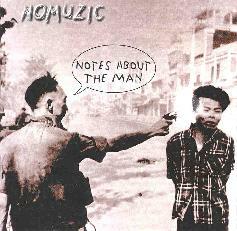 On Nomuzic's "Notes About The Man", Carl goes in still another direction giving us a dozen electronic vocal tunes that remind me of darker versions of Bill Nelson's post-Be Bop Deluxe electronic pop or maybe even John Foxx. I think the dark feel comes from Carl's vocals which sound remarkably like Peter Hammill. Several guests (including a number of Alien Planetscapes alumni) contribute guitar, bass, and sax to several of the songs and one of my favorites is "The Chair" in which Steve Berman manages to make his sax quite at home alongside the electronica. The music itself is pretty good and includes plenty of spacey bits and interesting synth work. Check it out for Carl's Nomuzic take on the pop song. 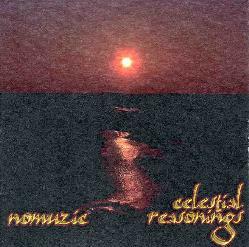 In yet another twist, for "Celestial Reasoning" Nomuzic travels directly into the electronic space. Though there's some quite good but standard floating electronica here, there are also some very freaky explorations that have found the hidden, more colorful watering holes of space. "Voltar's Song" is my hands down favorite on the disc. A monologue, apparently taken from some old UFO files thingy, tells of encounters with aliens. The story is accompanied by some pretty wild sounds, noises, and general weirdness making this a hell of a cool track. "The Fathers Perish" is dominated by its monologue, this time very much along political lines, and is backed by efx'd voices and wild non-musical synth sounds. The other two standout tracks are "For Old Mibs" and "Earthwave". "For Old Mibs" is a subtle and slowly developing space exploration. A pulsing beat pounds in your chest while multiple synth lines dance about, all backed by a choral textured background. "Earthwave" is similar to "For Old Mibs", but explores the quietest, most frightening regions of space. What makes it really wild is the intermittent Japanese music and spacey Geisha vocals, and later tribal percussion and chants. World space music? Who knows but it's interesting and more creative than the standard space electronic faire. For more information on both The Land Of Guilt + Blarney and Nomusic you can email Carl Howard at litlgrey@ix.netcom.com.